(sak), Do not confuse this word with sack. 1. A pouch or bursa. 2. An encysted abscess at the root of a tooth. 3. The capsule of a tumor, or envelope of a cyst. (sak) a pouch or bag. allantoic sac the dilated portion of the allantois, becoming a part of the placenta in many mammals; it becomes the urachus in humans. 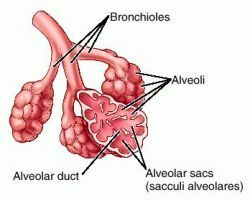 alveolar sacs the spaces into which the alveolar ducts open distally, and with which the alveoli communicate. amniotic sac that formed by the amnion, containing the amniotic fluid. chorionic sac that formed by the vertebrate chorion, surrounding the embryo, amniotic cavity, and amniotic sac and contributing to the fetal part of the placenta. conjunctival sac the potential space, lined by conjunctiva, between the eyelids and eyeball. dental sac the dense fibrous layer of mesenchyme surrounding the enamel organ and dental papilla. 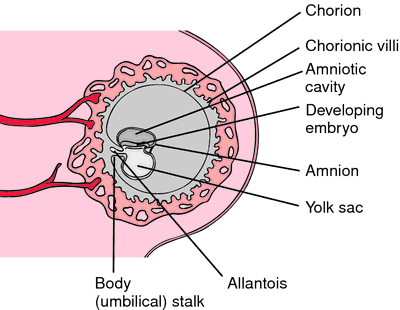 gestational sac that comprising the extraembryonic membranes that envelop the embryo or fetus; in humans, that formed by the fused amnion and chorion. hernial sac the peritoneal pouch enclosing a hernia. lacrimal sac the dilated upper end of the nasolacrimal duct. yolk sac the extraembryonic membrane that connects with the midgut; at the end of the fourth week of development it expands into a pear-shaped vesicle (umbilical vesicle) connected to the body of the embryo by a long narrow tube (yolk stalk) . In mammals, it produces a complete vitelline circulation in the early embryo and then undergoes regression. A pouch or pouchlike structure in an organism, sometimes filled with fluid. a pouch or a baglike organ, such as the abdominal sac of the embryo that develops into the abdominal cavity. A pouch or other enclosed anatomic structure. Medtalk A pouch or other enclosed structure. See Alveolar sac, Gestational sac, Pouch, Yolk sac. Any bag-like organ or body structure. a bag-like or pouched structure. 1. Encysted abscess at the root of a tooth. 3. Capsule of a tumor, or envelope of a cyst. SAC Veterinary Science Division Reports monthly reports of major diseases encountered in the 8 veterinary diagnostic laboratories in Scotland; reported in the Veterinary Record.